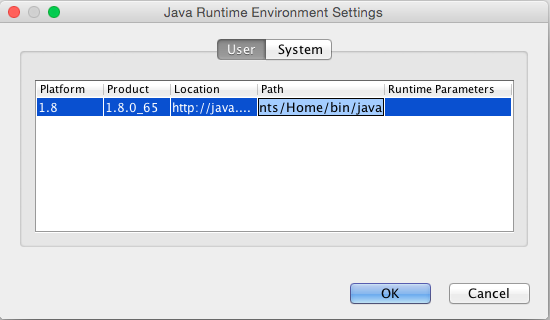 any idea why java 7 is not showing up? So this is the line causing the problem every time I opened a new terminal window. Simply remove this line will solve the problem. You still need to follow what @aleroot said, but if that doesn't work for you, check the .bash_profile (or .bashrc) setting file to see if you've previously exported any java version. To easily and quickly open the Java Preferences pane in Mac OS X you can simply call spotlight with ⌘+SPACE and type System Preferences it will show up in the last row of the window. in the terminal, it'll return /usr/bin/java. (which in turn points to /System/Library/Frameworks/JavaVM.framework/Versions/A/Commands/java, which is Apple's 1.6 version). Install the JDK 7 and this problem will solve itself. Be sure to get the Java Development Kit (JDK) which includes compilers and stuff like that, rather than just the Java Runtime Environment (JRE) . In my case, the issue was that Oracle was installing it to a different location than I was used to. Command-Space to open Spotlight, type 'System Preferences', hit enter. Click Java icon in bottom row. After the Java Control Panel opens, click 'Java' tab, 'View...', and verify that your install worked. You can see a 'Path' there also, which you can sub into the commands below in case they are different than mine. I had run into a similar issue with terminal not updating the java version to match the version installed on the mac. I have come up with a temporary and somewhat painful but working solution. As I mentioned this is a temporary band-aid solution because the java home path is being hard-coded. There is really no way to set the path to get the latest as that is what Apple is supposedly doing for terminal already and the issue is that Apple's java_home environment variable is not getting updated. Since El Capitan, it is difficult to delete the /usr/bin/java symlink, because of the introduction of the new "rootless" policy. To reload your .bashrc file for the current session, run source ~/.bashrc in the shell. You only have to do this for sessions that had been started before changing the .bashrc file. Now the latest version is used, when you use java in the shell. The basic issue: /usr/bin/java is pointing to one provided by OSX itself initially (/System/Library/Frameworks/JavaVM.framework/Versions/Current/Commands/java) We need to point this to the one downloaded by the JDK installer. The below steps are for OSX 10.10.4 Yosemite. 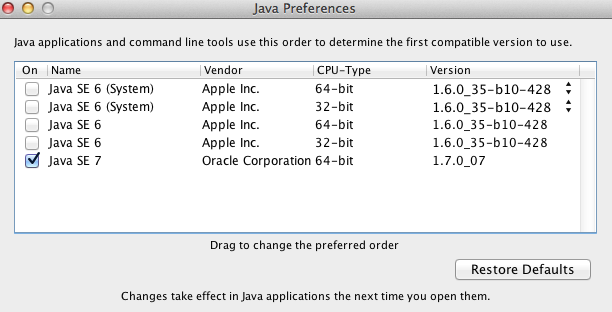 Open System Preferences -> select Java. The Java window opens. Click on Java tab at the top. Click on 'View' button. Thats it. To verify, you can just run java -version on the terminal. It should output the latest version that you installed/updated to. And this replaces the java old with new one. and that fixed my Java 8 issue. http://www.java.com/en/download/faq/java_mac.xml is a nice place to understand, while Apple is stopping support to Java, why Java Preferences doesn't exist anymore and rely on System_Preferences => Java => Java if Java 7 from Oracle is installed. This will allow you to switch at any time between your installed JVMs. And you have much more commands available. Hard-coding the JAVA_HOME path might not be the best idea. The /usr/libexec/java_home utility sill works for me on Mac OSX Lion 10.7.5 and JDK 1.7.0_13. According to its man page, it is meant to be used with Apple's old Java Preferences pane, but it appears to be working with the replacement provided by Oracle (Java Control Panel). For example running /usr/libexec/java_home -V lists all installed JDKs (both 1.6. * and 1.7. *) on my machine. This is nuts! How does Oracle provide an installer that doesn't install anything!? The process is similar if your java folder is located in different locations. I think you can try to install jdk not jre. By installing jdk, the java in /usr/bin/java will be replaced, and all library will work fine. Based on this , we might get a hint to proceed further ? i resolved this issue by re installing Yosemite and then cross check java version on terminal (java -version) and (javac -version) .It work perfectly now.It is not changing to java 7 as version 6 still present on (command + n) libray>java>javavirtualmachine>your javac current version.you need to address to java home . sudo ln -s /Library/Java/JavaVirtualMachines/jdk1.8.0_31.jdk/Contents/Home/jre/bin/java /usr/bin/java did not work for me because I got Operation not permitted. El Capitan now protects certain system directories in "rootless" mode (a.k.a. System Integrity Protection). It is applicable to macOS Sierra, and probably new macOS versions for the foreseeable future. Installing through distributed JDK DMG from the Oracle site auto-updates everything for me. I have seen (in El Capitan) updating through System Preferences > Java do updates but that do not reflect to command line. Installing through DMG does the job. Not the answer you're looking for? Browse other questions tagged java macos java-7 or ask your own question.